Above Commonwealth Basin’s broad woodland, Red Pass is visible as the cleft between Lundin Peak (left) and the aptly named Red Mountain (right). Pacific Crest Trail, Section J, October 14, 2018. 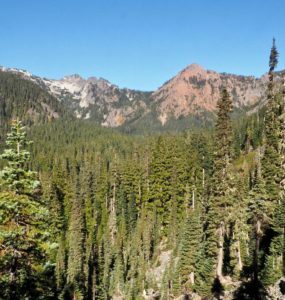 In earlier days, the trail along Commonwealth Creek formed one leg of the old Cascade Crest Trail before it was rerouted and renamed as the Pacific Crest Trail (probably to avoid the creek’s variable flooding and surrounding bogs). Now much less visited and seeming almost forgotten and wild, Commonwealth Basin offers a bit of solitude as its trail meanders through old-growth forest and pooling waters before climbing to a view every bit as grand as that from the Pacific Crest Trail’s better-known Kendall Katwalk on the other side of Red Mountain. The trail shares a trailhead with the segment of the Pacific Crest Trail that leads north to Kendall Katwalk and, after skirting Kendall Peak’s flanks for 2.50 miles/4.00 km, splits off into Commonwealth Basin and continues another 2.00 miles/3.20 km up to Red Pass. An abandoned trail-turned-bootpath continues a scant quarter mile/0.40 km to the lowest peak of Lundin Peak’s false summit. 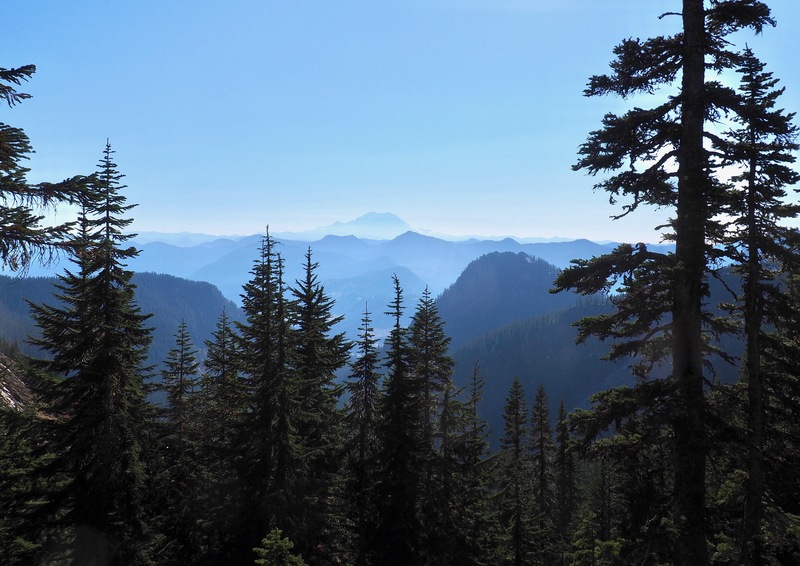 This profile begins where the Commonwealth Basin Trail branches from the Pacific Crest Trail. Although Commonwealth Basin is a popular winter snowshoeing destination, avalanches on Red Mountain and down Red Pass have proven deadly. In winter and spring, be sure to check trail conditions and avalanche forecasts before venturing up the pass. At any time of year, expect to encounter soggy ground throughout the basin where the trail has fallen into disrepair. And, at Red Pass and Lundin Peak, exercise caution along the cliffs’ edges that create their dramatic views. After diverging from the Pacific Crest Trail, the trail to Red Pass descends into Commonwealth Basin, cloaked by dense, old-growth forest that parts here and there in boggy glades. 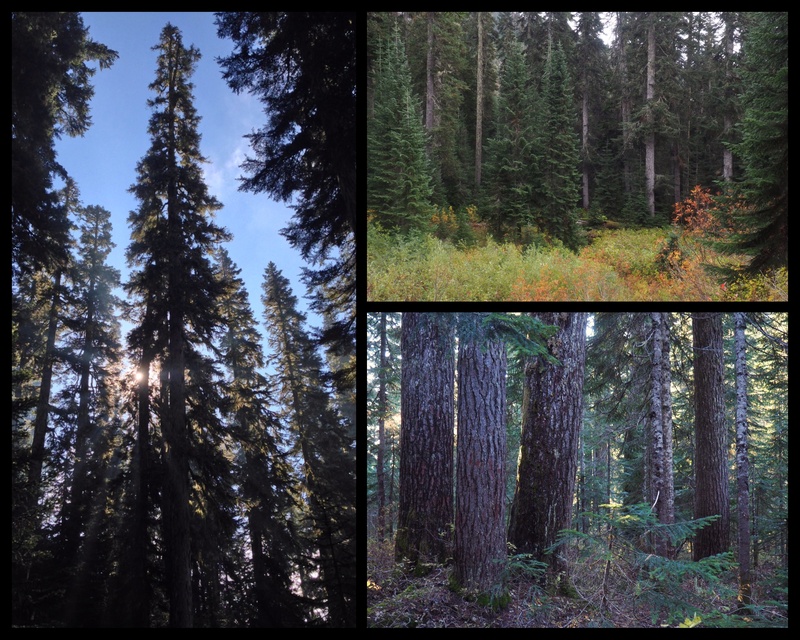 Commonwealth Basin – Red Pass Trail, October 2014, 2017, and 2018. The trail can be damp, depending on the season, and twice crosses Commonwealth Creek by way of stones and logs. The first and most challenging crossing, shown here during relatively low creek flow, may require traversing a combination of stones and logs to reach the other side. Or, one can merely ford the rather shallow creek if wet footwear is not a concern. Commonwealth Basin – Red Pass Trail, October 07, 2018. 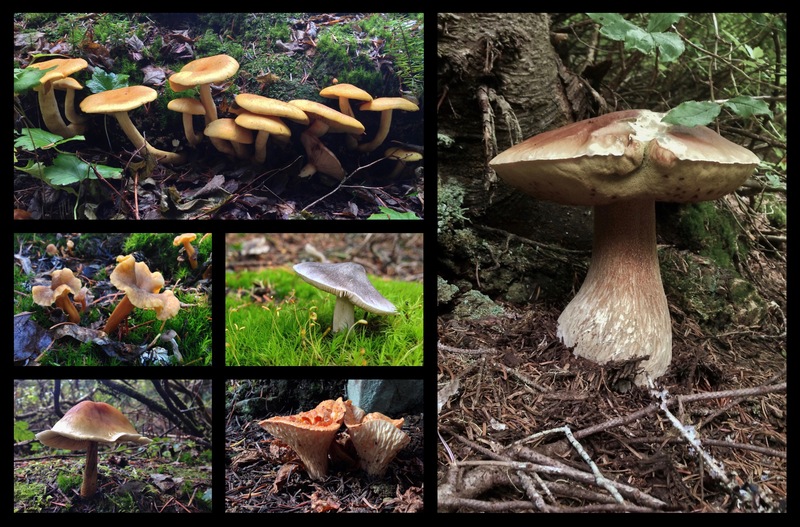 Beginning in mid-summer and continuing through autumn, a panoply of mushrooms proliferates throughout the basin and up the pass. Commonwealth Basin – Red Pass Trail, August 24, 2013 and October 19, 2014. Aptly named coral fungi mimic fanciful undersea castles on the forest floor. 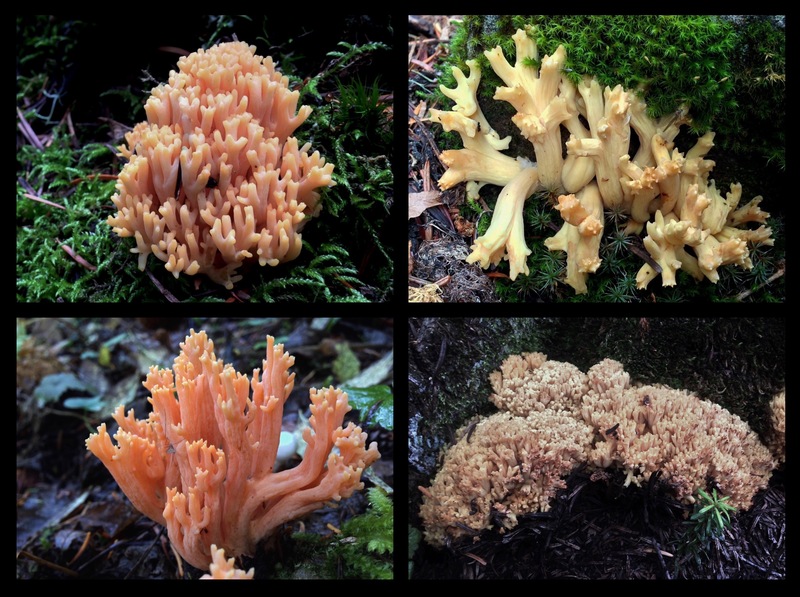 Difficult to distinguish, the many similar-looking species commonly known as coral fungi are spread across many families and orders of the Fungi kingdom. 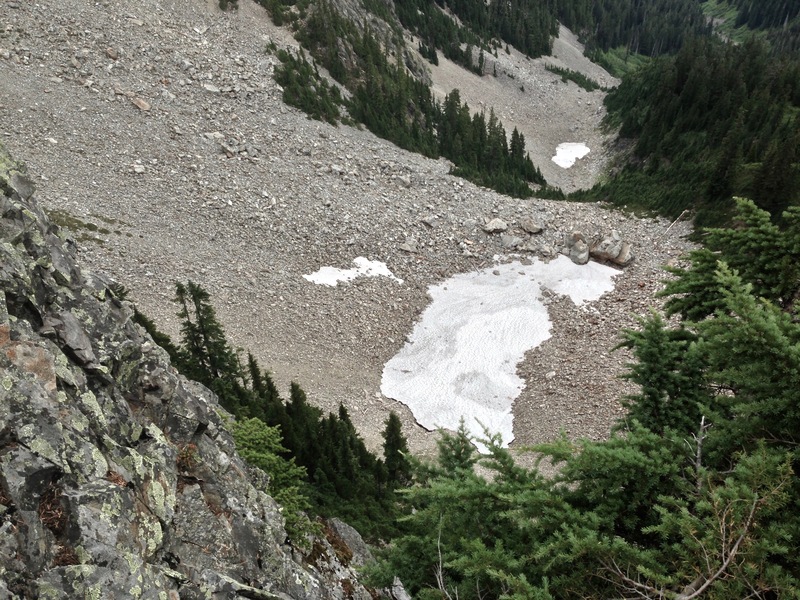 Commonwealth Basin – Red Pass Trail, August 24, 2013 and October 19, 2014. Other unique forms of fungi flourish throughout the basin. 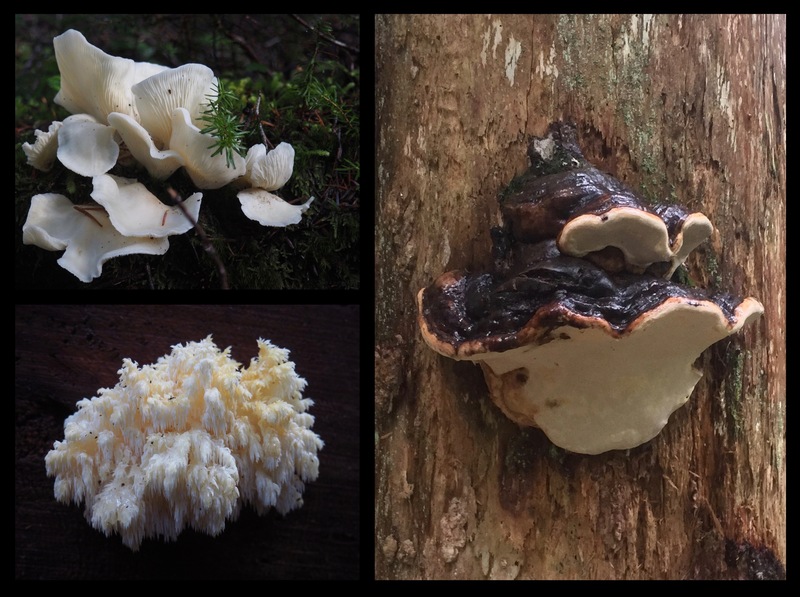 In the top left, shell-like “petals” of a mushroom colony “bloom” from a wayside log. In the lower left, what is likely a species of coral tooth fungus (Hericium sp.) delicately fringes another fallen tree. On the right, an ogre’s face emerges from a trailside snag in the form of a giant wood conk (likely an artist’s conk, Ganoderma applanatum). Commonwealth Basin – Red Pass Trail, October 18, 2015 and October 22, 2016. 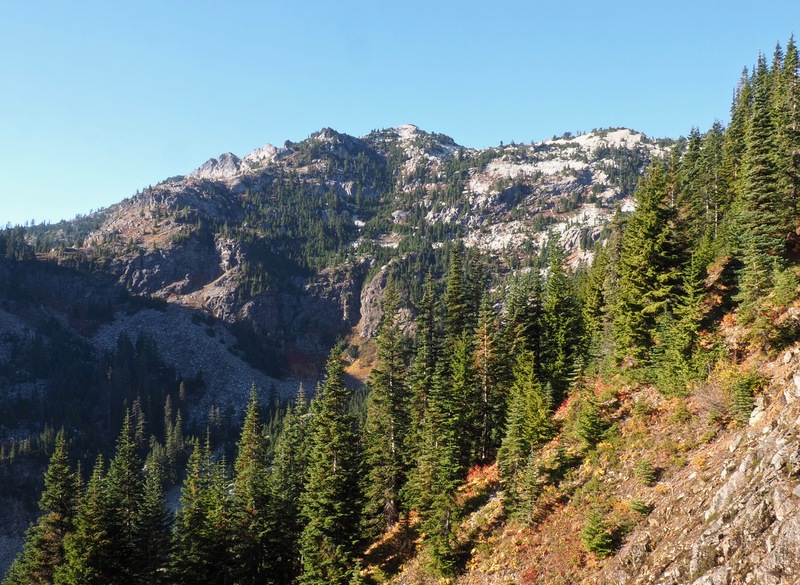 From the far end of Commonwealth Basin, the trail begins its steep ascent up Red Pass, where views reach to the surrounding peaks, including Red Mountain’s serrated ridgetop to the east. Commonwealth Basin – Red Pass Trail, October 22, 2016. Mount Snoqualmie walls the opposite side of the trail to the northwest. Commonwealth Basin – Red Pass Trail, October 29, 2017. Just a half mile/0.80 km below the top of Red Pass, a short side trail leads leftward to Red Pond and bit of level ground before the final push. Commonwealth Basin – Red Pass Trail, October 21, 2018. Although the trail is walled by conifers, the deciduous understory shrubs add autumn color throughout. At the trail’s higher elevation, blueberries’ (Vaccinium sp.) 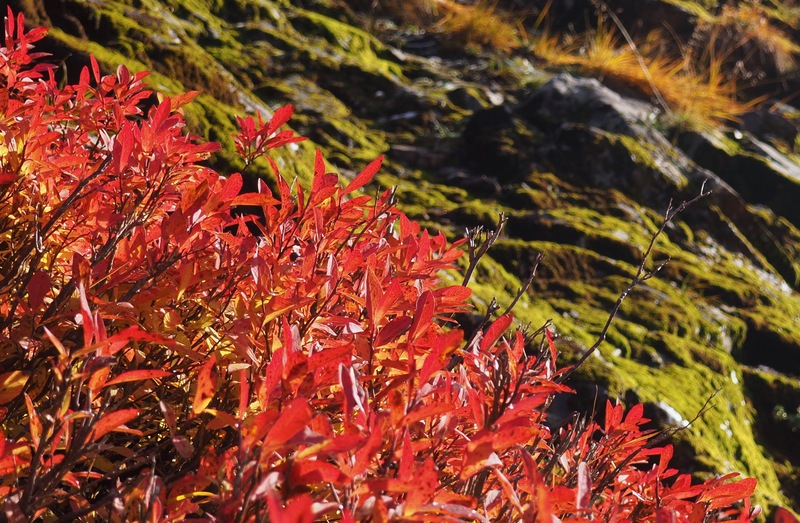 vibrant autumn leaves contrast with the trailside’s mossy mountain folds. 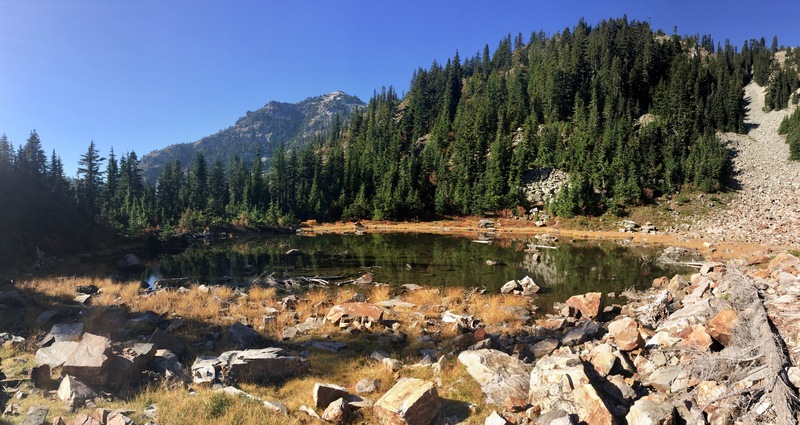 Commonwealth Basin – Red Pass Trail, October 22, 2016. Stunning views extend from either side of Red Pass. The southern view retraces the trail’s route across Commonwealth Basin and beyond to Mt. Rainier on the horizon. Commonwealth Basin – Red Pass Trail, October 29, 2017. Mount Thompson’s stony spire dominates the northern view from Red Pass. Gravel Lake lies hidden from view just below its summit. 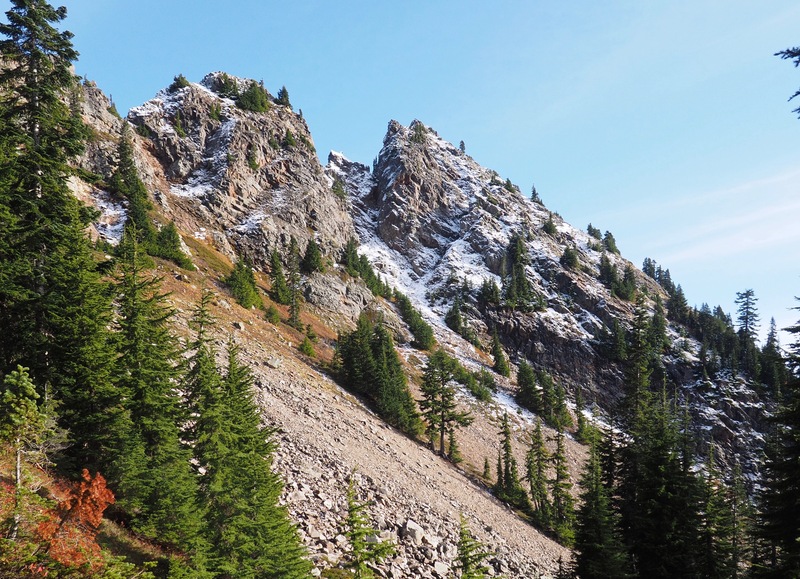 Commonwealth Basin – Red Pass Trail, October 19, 2014. The top of Red Pass is a narrow saddle of rock between Red Mountain and Lundin Peak. On its northern edge, only a small rock wall separates the trail from the plunging precipice beyond – exercise caution while taking in the vistas on either side. Commonwealth Basin – Red Pass Trail, August 24, 2013. Beyond Red Pass, the trail is designated as “abandoned” but is generally easy to follow as a bootpath worn by continued use. The trail terminates on the lowest of three points atop Lundin Peak, with a view across a precipitous gap to the other two (upper left). Use extreme care along the ledges and do not attempt to proceed farther. Lundin Peak’s panorama is similar to that from Red Pass and includes views of Mt. Rainier to the south (upper right) and a host of other Cascade mountains to the east and north (bottom). 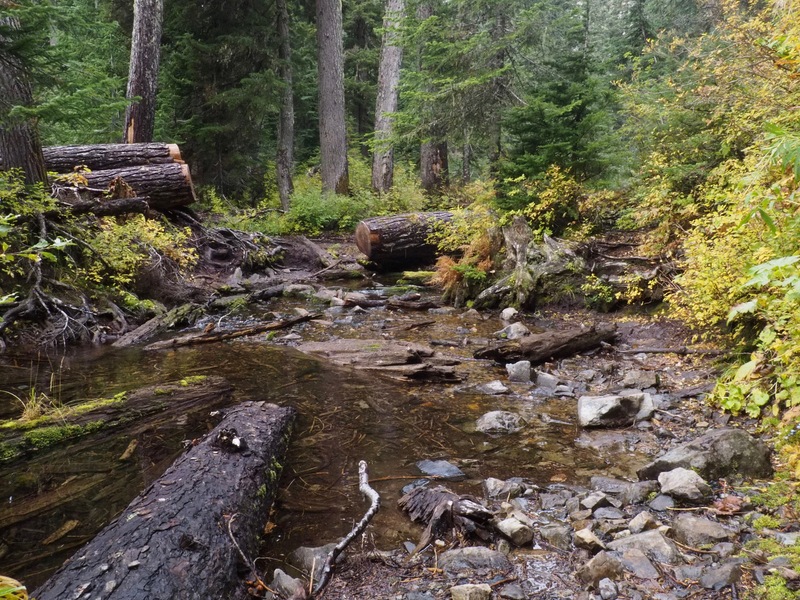 Commonwealth Basin – Red Pass Trail, October 29, 2017 and October 21, 2018.